From Grant comes the Vortex Pro Kitchen/Utility System Oil boiler, a highly reliable unit which comes with a variety of features and benefits. As a System boiler it will send hot water to both the radiators and a sealed hot water storage cylinder. It is is a condensing and floor standing unit which has been designed and manufactured to be placed in a kitchen or utility room. This boiler has a high efficiency rating of 91.7% making the unit A rated. The output rating of 26-36kW makes it perfect for the larger home with multiple bathrooms and a higher demand for heating or hot water. This boiler features an internal condensate trap which has external options available, a high efficiency circulating pump, the capacity for a plug in programmer, front service access and a Riello RDB burner which includes a plug and socket connection as standard. 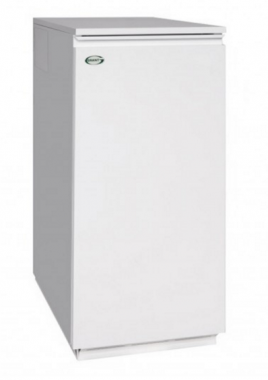 This boiler is an VTX 1521 model and is compact in size at only 348mm wide. There are other outputs available ranging from a 15kW to a 70 kW so you should be able to find a model to suit your needs. This boiler is an award winning product which comes with a 5 year warranty to give you peace of mind that you have bought a reliable boiler for your home.